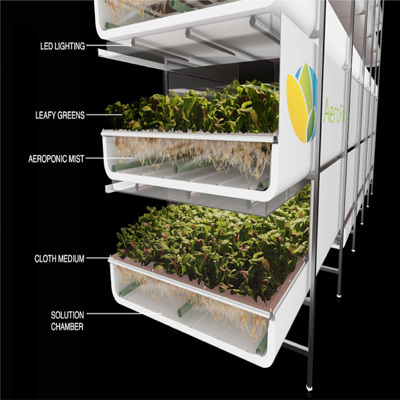 AeroFarms is transforming the concept of a traditional, sprawling, outdoor field of greens into an efficient, IoT-controlled, indoor, vertical grow house. Owned by Dream Holdings and based in Newark, NJ, AeroFarms aims to revolutionize how we grow produce such as kale, arugula and watercress. This alternative approach, called vertical farming, combines data science with horticulture and involves growing produce indoors, on shelves stacked seven levels high, without soil or sun but with a megadose of LED lighting and automation technology. The technology used to grow the produce is known as aeroponics. With aeroponics, plants are grown through a reusable fabric, removing the need for soil. There is no sunlight, and less water is used compared to conventional farming. Plants are misted from below and provided with a nutrient rich solution that encourages growth. The use of specially engineered LED lights allows scientists to control different aspects of the plant, such as size and flavor, along with smart nutrition, which gives scientists the ability to monitor all the macro- and micronutrients the plants require. AeroFarms plant engineers note that they can take the exact same seed from the field and grow it in half the time as a traditional field farmer. This leads to 390 times more productivity per square foot than a commercial field farm. The aim for companies such as AeroFarms is to provide locally grown produce at a more affordable price. Another goal is to grow produce in metro areas that would not otherwise be able to accommodate traditional farming methods. “Cities have a lot of mouths to feed. We have population growth, urbanization, and we need better ways to feed humanity that are sensitive to the environment," said Rosenberg in a recent statement. “Vertical farms are one of many solutions." According to Global Market Insights, the vertical farming market is expected to generate a sizable revenue over the next seven years. A recent report from GMI stated that vertical farming market size is expected to cross $13 billion by 2024, with a striking CAGR of 27 percent over 2017-2024, having had a base valuation of $2 billion in 2017. Currently, this type of farming is most prevalent in the United States and China. During the next few years, Belgium, UK, Netherlands and Germany are slated to be major revenue contributors. With the elimination of seasonal crops or run-offs, crop spoilage is no longer an issue in an indoor farm. This combined with decreased transportation costs is fueling the expansion of the vertical farming industry. Recently, Dell joined forces with AeroFarms to focus on how IoT and data science can help maximize the growth of greens. With Dell’s new distributed core IoT strategy, AeroFarms can improve its architecture and reduce costs, leading to better yields and further enhancements in vertical farming technology. Explore the AeroFarms website for further details about its mission to transform agriculture. Check out this 360-degree tour of the world’s largest indoor vertical farm. Read about harvesting insights: The Dell Technology partnership with AeroFarms.